Democratic group is emboldened by victories for Nassau County executive and Hempstead town supervisor. 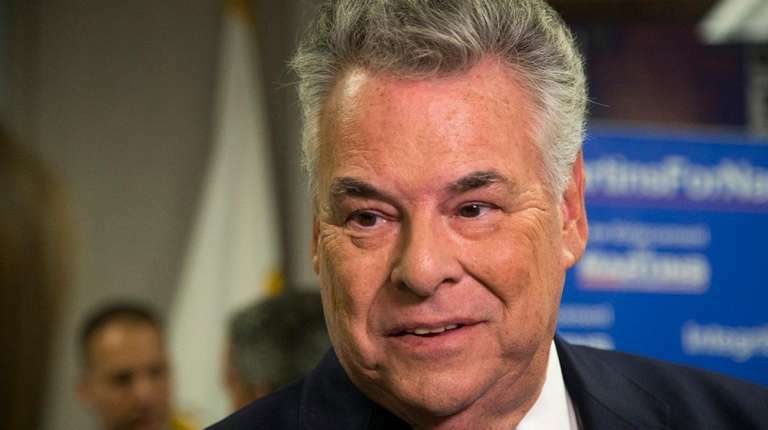 The seat held by 13-term Republican Rep. Peter King was added Thursday to the Democratic list of districts the party views as vulnerable enough to flip in the 2018 midterm election. New York’s 2nd Congressional District is considered safely GOP in major race rating systems such as the Cook Political Report, but its designation by the Democratic Congressional Campaign Committee as in-play comes on the heels of Democratic victories Tuesday in the Nassau County executive and Hempstead Town supervisor races. King, of Seaford, is one of 11 additions to the DCCC’s list of targets as the party works to regain a majority in the House. The DCCC is eying 91 total GOP-held seats for 2018. “With today’s battlefield expansion, we are now challenging 68 districts where President Trump won by large and small margins,” DCCC chairman Ben Ray Luján wrote in a memo. But King has defeated Democratic challengers in recent races by healthy margins, and in Washington he is considered a lawmaker who can work across party lines, including encouraging President Donald Trump and Senate Minority Leader Chuck Schumer (D-N.Y.) to collaborate where they can. He opposes Trump’s proposed cuts to counterterrorism grants used in part by the NYPD and has spoken against the elimination of state and local tax deductions in the GOP tax plan — positions also held by Schumer. “Regardless of his posturing or rhetoric, Representative King will be held accountable for this harmful GOP tax scam,” DCCC spokesman Evan Lukaske said. Lukaske noted King voted in favor of Republican efforts to repeal and replace Obamacare, though such measures have failed. “What they’re doing is they’re going after anyone who’s in a SALT state,” King told Newsday, referring to GOP representatives in high-taxed states whose constituents would be hard hit by the axing of the state and local tax deduction. King, Long Island’s longest-serving sitting congressman, pointed to his work with local Democrats on fighting for superstorm Sandy aid and the 9/11 health and compensation bill. The Democratic primary candidates for New York’s 2nd Congressional District are business owner Tim Gomes of Sayville and nonprofit leader Liuba Grechen Shirley of Amityville. New York’s 1st Congressional District, represented by Rep. Lee Zeldin (R-Shirley), was among the DCCC’s first round of targets announced in January.